If you’re under the impression that the only thing you can do with a melon is make a fruit salad, this post is for you. Some melons are actually treated as vegetables in the culinary world, while others are sweet and definitely considered fruits. Did you know that cantaloupes in North America are different than those in Europe? Or that watermelons can have gold-colored flesh? Let’s learn more about melons. 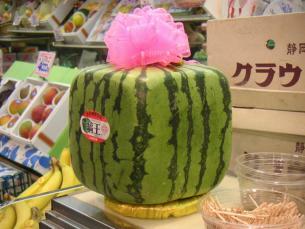 Yes, watermelons can be square! How Does a Melon Grow? Melons grow on vines and are considered fruits, though some are treated as vegetables in the culinary world. Bitter melon and winter melon are the vegetables of the melon family—they probably won’t be on the dessert menu! Watermelons can be large or small, round or square (shown above), with red, pink, or even orange flesh. The seeds can be black or brown, and seedless varieties may have small white edible seeds. Cantaloupes in North America have netted rinds and orange, sweet flesh, while European cantaloupes have smooth, green ribbed rinds. Honeydews have a creamy yellow-colored rind when ripe, and a light green flesh that’s sweet in flavor. How Do I Choose a Melon? Look for a melon that is heavy for its size (this means it’s juicy). Make sure the melon has no scars or bruises, and look for a yellow-colored spot, which is where the melon sat on the ground as it ripened. If it doesn’t have the spot, it was likely picked before it was ripe. Avoid melons that are piled on top of each other in bins, as this can crush and damage the fruit. To tell if a cantaloupe is ripe, smell it at the stem end and see if it’s sweet and musky. Another way is to press it on the end opposite the stem end and see if it gives a bit. If the color under the netted rind is green, it’s not ripe. When it comes to honeydew, there should be a sweet smell and the skin should have a yellow color to it, rather than beige or green. The only way to tell if a watermelon is ripe is to thump it with a flat hand; the sound should be deep. If the melon is not quite ripe yet, you can leave it (uncut) on your counter for a couple days or put it in a paper bag to ripen. After it is cut, store it in an airtight container or wrapped in plastic wrap in the refrigerator; it’s nice to bring it closer to room temperature before you eat it. There are many different ways to cut melons, from slicing to cutting them into chunks to using a melon baller to scoop out little spheres of fruit. 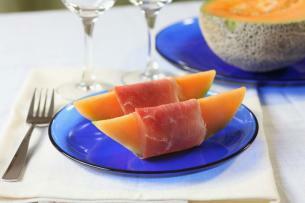 Try a simple summer appetizer of canteloupe (or honeydew) wrapped in prosciutto ham (as shown in the picture above). This sweet, salty combination is always a hit! And one more: You’ll be the star of the potluck supper if you surprise everyone with Pasta with Prosciutto and Cantaloupe as your contribution..
Watermelon salads are in abundance each summer. Try this one with watermelon, feta, and basil. Or opt for the watermelon-cucumber salad, with a zing of lime juice. Go Italian with this watermelon Caprese salad (tomato, basil, and mozzarella). Try a grilled bitter melon, mango, tomato salad to see if you like the vegetable melons! Mix up an easy fruit smoothie with cantaloupe, any other fruit you like, soy milk and ice. Honeydew and shrimp salad with mangoes and mint would be fantastic for an evening meal on the back patio. You’ve got to check out these Watermelon Pops! This is a fun frozen dessert that calls for watermelon, honeydew, vanilla ice cream and chocolate chips. I LOVE the square melon! I wonder what it looks like when you cut it open? ooh, thank you so much for linking to my watermelon/feta/basil salad!!! Olga, those flavor combinations are really wonderful! Everyone should give it a try! I don’t have a knack for buying the right melons at all, so this is an incredibly helpful post. Thank you! Is there anyway to rippen a melon once you have cut it in half? Once a melon is cut, it will no longer “ripen” and there is not much you can do to change that. Oh I love melons with prosciutto, they work well with mangoes too. Its well worth the drive to the imported store to get them. I love watermelon. So delicious too. I asked a man at a California fruit stand how to pick a honey dew. He told me to choose the one that has those brown crack-like lines on it because that means it is so full of juice that the skin is “splitting”. Hmmm, I never heard that one before but I will keep it in mind! I have heard that the lines you sometimes find on jalapeno peppers can indicate that they are extra hot.